Obviously we all love trout fishing, but what’s even better is catching! Fishing is a challenge, call it an art form, call it a pastime, call it whatever, but there is a reason reeling in a fish is such a rush, its rewarding. You versus nature, you versus trout and the trout have many advantages. Trout in particular seem very elusive, for a few reasons. First, let’s take a look at eyesight. A trout’s eyes are different than ours, they see things great at a distance, but close range is a different story. Second, Trout do not have eyelids and expel light using their retinas whereas humans expel light using the pupil, that’s why trout head for shade when it’s sunny out. Third, trout can also hear extremely well, in fact they have a special nervous system running down their body that actually feels sound, so you might think twice about hollering out while you are on the bank, they can feel you coming! It seems like the trout have all the advantages, and they did until now! Trout can NOT resist Magic Bait’s new floating Krill Bait. The reason is simple. It’s in the title right on front of the label, KRILL! 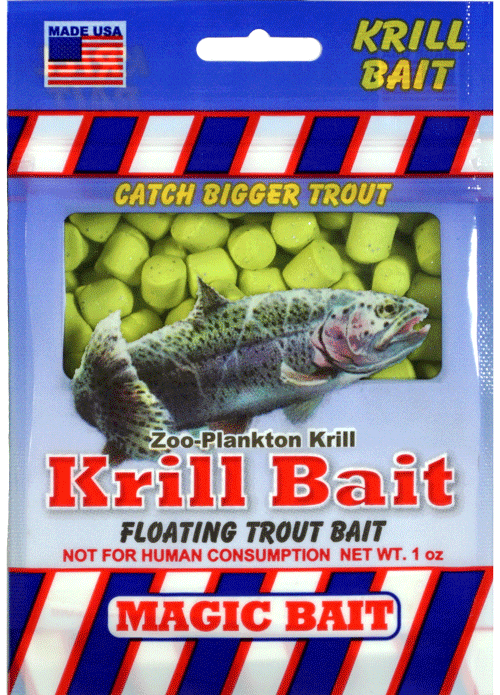 Krill is a trout super attractant, it has everything that a trout instinctively wants and needs. Krill has a balanced protein profile, it is high in fatty acids and amino acids along with minerals, making it extremely irresistible to trout and has been proven time after time to be their favorite bait. I’m sure you have tried just about every flavor of trout dough bait, (and there are a ton of them,) corn, garlic, anise, salmon eggs, cheese, and probably alot more, if you look in your tackle box you would probably find half a dozen or more half empty jars of dough bait that were moderately but inconsistently effective and thrown aside, that’s because they were all a man-made attempt at being an attractant. Magic Bait has spent the last 20 years formulating the perfect trout bait, a natural attractant. 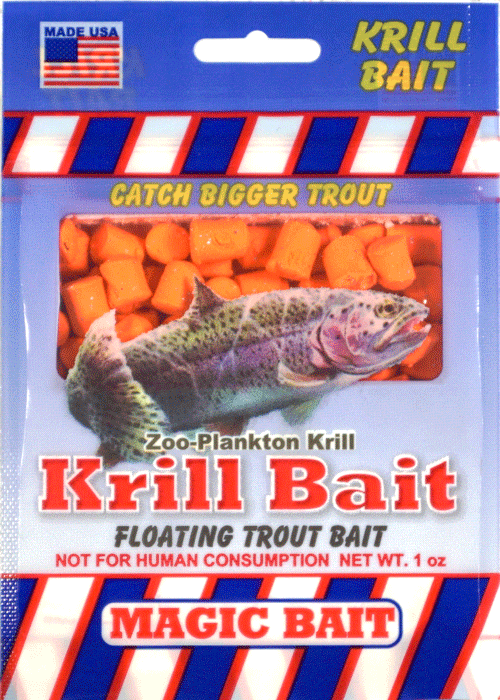 Krill has proven time after time to consistently attract, and land more trout than any other bait. 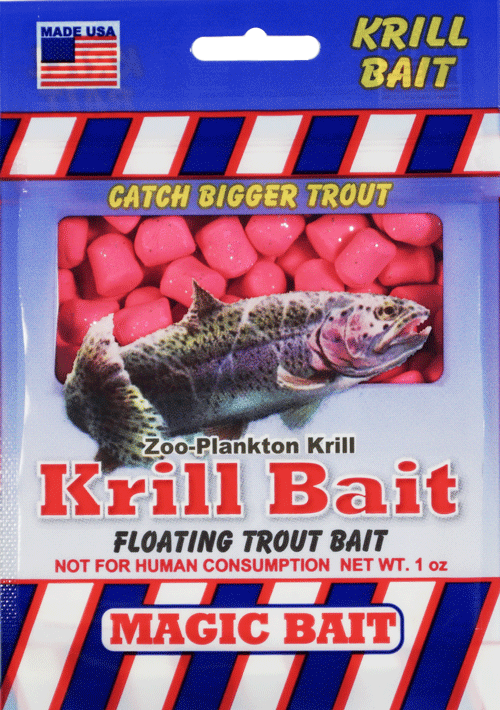 The only problem is, krill are difficult to process into a bait that will actually work, but Magic Bait has done just that with our unique proprietary process for producing Krill bait. The fact is there are a lot of baits and they all claim to be the best but they turn out to just be snake oil. Like I said earlier, that’s because they are all a man-made attempt at being an attractant. Magic Bait has taken the perfect natural attractant and turned it into the perfect trout bait. It’s tough to beat nature, so Magic Bait has simply started using nature! 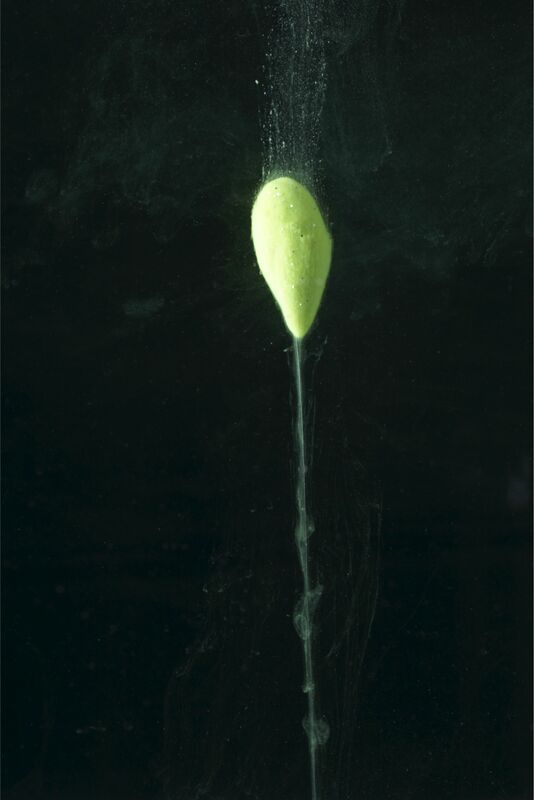 This bait is tough, effective and stays on your hook no matter what the conditions are, this bait bites itself onto your hook, it’s not coming off, even in moving water! Pick a bag up before you head for your favorite trout spot! Best thing about spring? Crappie fishing! Crappie fishing is easy, anyone can do it, crappie catching is a different story. The reason people have a variety of colors, styles and all sizes of lures in their box, is because crappie can be hard to catch. Even with a good selection of lures to throw at the crappie, there are still variables that impact the catch. Happy New Year and welcome to Magic Bait. This is my first blog and I will be keeping it short. We wanted to start a blog to offer a simple common sense point of view on everyday events and topics.